I got this recipe from Rachael Ray’s cookbook “Yum-O!” which is a family cookbook that benefits her nonprofit organization Yum-O! I got to meet Rachael Ray and interview her about her nonprofit activities which focus on childhood nutrition and healthly eating. She shared her secrets about feeding kids, signed my copy of her Yum-O! cookbook, and even gave a shout out to The Doctor Yum Project on her website! I love this recipe for her “Mom’s Baked Apples”. I made a few minor modifications, but basically this is a WINNER. 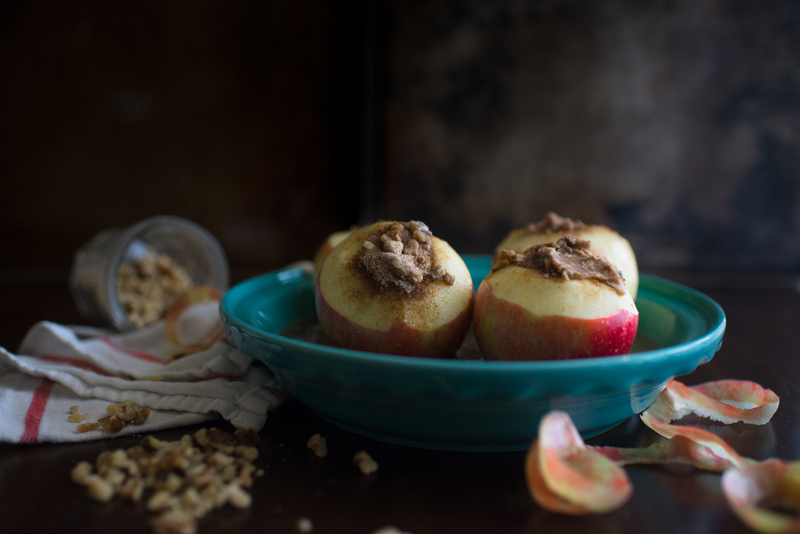 Baked apples are stuffed with a crunchy combination of grapenuts, currants and spices. The tiny tasters loved this, and so did I. It’s a perfect afterschool or weekend snack. It would be great as a dessert topped with a little bit of vanilla bean ice cream, too. Preheat oven to 350 degrees. Cut an X into the stem side of an apple with a sharp knife. Use the knife to core out a wide section of the apple, about halfway down. Use a teaspoon to scoop out the core with the seeds, creating a cavity for the stuffing. If the apples don’t stand upright, trim a bit of the bottom to help them stand flat. Mix the remaining ingredients with your hands until combined, breaking up the butter as you go. Stuff the cereal mixture up to the top of each apple. Bake on a small cookie sheet or small baking dish (a little mist of oil will keep it from sticking) for 35-40 minutes until the apples are tender. Cool slightly before eating. Roast an extra apple for baby, with our without the fillings. Let cool and purée to desired consistency or cut into small soft bite-sized pieces for finger food eaters.